The ubiquity of digital images has profoundly changed the responsibilities and capabilities of anyone and everyone who uses them. Thanks to a range of innovations, from the convergence of moving and still image in the latest DSLR cameras to the growing potential of interactive and online photographic work, the lens and screen have emerged as central tools for many artists. Vision Anew brings together a diverse selection of texts by practitioners, critics, and scholars to explore the evolving nature of the lens-based arts. 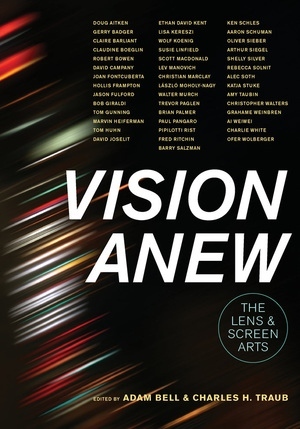 Presenting essays on photography and the moving image alongside engaging interviews with artists and filmmakers, Vision Anew offers an inspired assessment of the medium’s ongoing importance in the digital era. Contributors include Ai Weiwei, Gerry Badger, David Campany, Lev Manovich, Christian Marclay, László Moholy-Nagy, Walter Murch, Trevor Paglen, Pipilotti Rist, Shelly Silver, Rebecca Solnit, and Alec Soth, among others. This vital collection is essential reading for artists, educators, scholars, critics, and curators, and anyone who is passionate about the lens-based arts. Adam Bell is a photographer and writer. Coeditor of The Education of a Photographer, he has written for numerous publications, including Afterimage, The Brooklyn Rail, The Art Book Review,FOAM Magazine, photo-eye, and Paper Journal. He is currently on staff and faculty in the MFA Photography, Video, and Related Media Department, School of Visual Arts. Charles H. Traub is chair of the MFA Photography, Video, and Related Media Department, School of Visual Arts, and president of the Aaron Siskind Foundation. His many books include Dolce Via: Italy in the 80s, The Education of a Photographer, and In the Realm of the Circuit, and his writings have been published in Connoisseur, Fortune, Newsweek, Aperture, U.S. News & World Report, Afterimage, Popular Photography, American Photographer, and The New Yorker.